The readers have been furiously writing in questions regarding my 2009 NFl mock draft. I've decided to respond to the questions . .here you go! I'm not a big guy on running backs early in the draft. However, in 2008 we saw rookie running backs like Matt Forte, Chris Johnson, Jonathan Stewart, and Teshard Choice & Felix Jones to a lesser extent, make a major impact on their offenses. With that said, like Mendenhall and Stewart were are 1 & 2 headed into 2008, Beanie Wells and Georgia's Knowshon Moreno are this years 1 & 2 respectively. The Buckeye, Wells, isn't as durable as you would want, when we watched rookie running backs like Felix Jones and Mendenhall go down for the season with injuries after helping their teams win, it was tough for fans. Wells is a 6'1", powerful 230 lb. back. In his 3 seasons at Columbus, Wells rushed for nearly 1,100 yards a season and scored 7 touchdowns or more each of his three years. But if it's stats were comparing, Knowshon is GOOD. In his two years in Athens, Moreno rushed for over 1,300 yards two seasons and scored 30 touchdowns in his career. In his sophomore season for the Bulldogs of Georgia, Moreno rushed for over 100 yards in seven different games, including a 163 yard performance in the Bayou against LSU. Wells has almost two inches and 30 pounds on the quicker Moreno, and because of that, I'm taking Chris Wells as the first running back overall. I like my backs more Marion Barber than Jonathan Stewart. Raji is top ten, lock. Everyone from Todd McShay to Walter Cherepinsky believes that the BC nosetackle doesn't fall past Green Bay at #9. 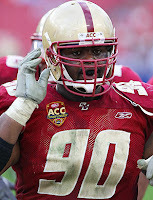 An interior defensive lineman like Raji makes every defensive player around him better, just ask Boston College linebacker, Mark Herzlich, how he was able to become the ACC defensive player of the year, I'm sure he'd give much credit to both B.J. Raji and Ron Brace. 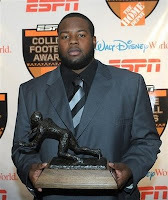 However, at the Senior Bowl, Raji was more impressive than arguably any other defensive lineman. He's a 6'2", 330 lb., nosetackle that clogs up the middle of the field better than nearly any player in the draft. As for the Springfield, Massachusetts native, Ron Brace, he gets overshadowed by Raji but don't be mistaken, he's just as nasty. At the combine Brace put up 225-lbs 32 times, only one shy of Raji's 33. He's an inch or so taller than Raji and relatively the same weight, although not as quick. The most likely scenario for Brace is a mid to early second round pick, with his performance at the combine and the lack of interior defensive lineman in this draft, expect both of them to be gone within the first two rounds. Raji to the Packers, Seahawks, or even as high as #3 to the Chiefs. Brace to the Chiefs (34) or Broncos (48). He isn't the best player in this draft, but how do you sell anyone else to a Detroit Lions fan? For starters, they've just watched previously left for dead Atlanta win 11 games and make it to the playoffs. While Michael Crabtree, Aaron Curry, and Jason Smith are probably the best players in this draft, you aren't selling any of these players to the fans of an 0-16 team. Secondly, you need a face of the franchise, maybe neither Stafford or Mark Sanchez from USC are Peyton Manning, but they can bring a fresh face to a rather dull franchise. Ideally, a quarterback like Stafford would have the time to sit and watch, learn a thing or two about being an NFL quarterback. However, in Detroit that may not be an option. Stafford would most likely be able to sit behind Daunte Culpepper who recently restructured his deal to stay in Detroit, given Culpeppers inability to stay healthy, you can expect young Stafford would see some time in his rookie season. Finally, I haven't completely ruled out former USC quarterback, Mark Sanchez, as the number one pick overall. Like Stafford, Sanchez isn't the best pick at #1, but he provides that face. When Matt Ryan was among the top players in last years draft, everyone maintained his maturity was what set him apart from the others. This weekend at the combine, around his peers, it was the maturity everyone talked about when they looked at Mark Sanchez. While they are only the best at there positions, and probably not overall #1's in every year, the Lions need Mark Sanchez or Matthew Stafford more than anyone. Wide receiver. Hands down. I've said it for months, Michael Crabtree is the best player available in this entire draft, but even he has questions surrounding him now. Both he and fellow top wide out, Jeremy Maclin, experienced set backs due to injury at the combine this weekend. With the amount of injuries the Seattle Seahawks went through in 2008, they've got to be 100% sure that Michael Crabtree is healthy, his foot is well, and that he is who we think he is. Jeremy Maclin was expected to show the blazing speed he was known for at Mizzou, unfortunately he was helped off the field at the combine after he suffered a hyper extended left knee. The top two prospects in this draft left Indianapolis healing injuries and not increasing their draft stock one bit. Darrius Heyward-Bey of Maryland, and Hakeem Nicks of North Carolina, the two ACC receivers are next on the board, both of them have major upsides. Heyward-Bey was the fastest timed receiver in Indianapolis this past weekend and Nicks had a monster 2008 campaign, scoring twelve touchdowns and racking up more than 1,200 yards. However, Heyward-Bey has questions surrounding his football acumen and despite the raw talents he displayed this past weekend, route running is very important at the next level. As for Nicks, many scouts have said he isn't a prototypical game breaking wide out, and he lacks the skill set of an NFL player, it may take him time to develop, alot of time. Other receiving prospects such as former Florida stud, Percy Harvin, will need to find a system that will work well with them. These are alot of questions for NFL teams to determine which players are worth the top picks. I generally have an extreme lack of respect for receivers, (I'm forced to cheer for guys like T.O. and Roy Williams) so I find it hard to believe they are as game changing as THEY think. to the back end of the first round. . . . . check back in early March for the updated 1st round Mocks. . .